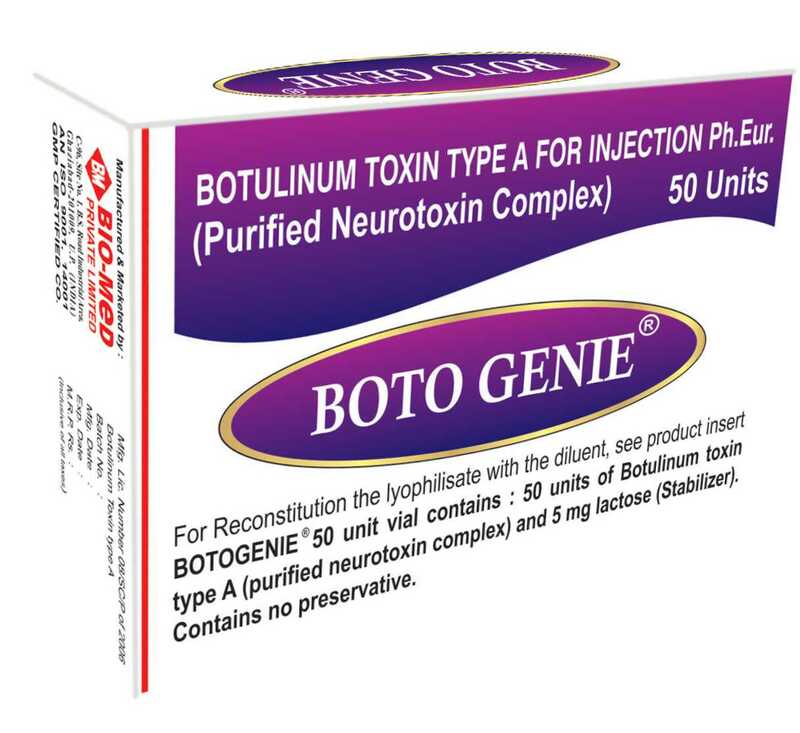 BOTO GENIE ® is a biologically active and highly purified preparation of Botulinum toxin Type A. This is an extremely potent neurotoxin complex which causes relaxation of muscles, marked reduction in gland secretory activity and silencing of nociceptor function on its absorption. The medical science has developed methodology to derive magical drug effect by unique formulation and controlled administration techniques. It has been used to correct undesirable muscular activity for a considerable period without surgical intervention. This action is reversible in nature in a few months. Since BOTO GENIE® is in a highly purified form & is used in minute quantities, it does not induce any immunological response even after several treatments in most subjects. BOTO GENIE® conforms to Ph.Eur. Available in 50 &100 unit vial along with appropriate diluent. Safe and effective use of BOTO GENIE® depends on selection of correct dose and administration techniques. It is extremely important for physician to know the detailed muscular & other anatomical aspect of the area proposed to be treated, any alteration to the anatomy due to prior surgical procedure for good results and success. Hypersensitivity to any ingredient in formulation. Infection at the proposed site of inoculation. Skin rash , pruritus , allergic reaction , localized pain , bruising may be associated with the injection which may occur rarely. Store BOTO GENIE® at 20C to 80C. Shelf life of BOTO GENIE® is 36 months. BOTO GENIE® reconstituted in aseptic conditions can be stored at 20C to 80C for 4 hrs.